Londonderry United Methodist Church offers a wide variety of ministries to provide for people at all stages of spiritual and life journeys. 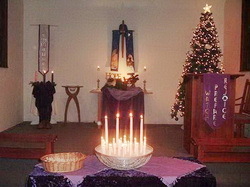 LUMC ministries enrich us spiritually, artistically, socially, physically, and/or intellectually. Check the top menu for more details. Worship: We hold three services of worship every Sunday - two traditional and one contemporary service. Sunday School: Sunday School classes are offered on Sundays from early September to early June for ages 4 through adult. Stephen Ministry: The Stephen Ministry assigns trained care-givers to provide confidential, supervised, Christian care to individuals who are struggling with life's challenges. Prayer Chain: The LUMC Prayer Chain accepts prayer requests from our community of faith and distributes them (primarily) via email to those on the Prayer Chain list. Prayer does work miracles! For Men: Men meet for Prayer Breakfasts every Wednesday at 6:30 a.m. for fellowship, prayer and study. For Women: The Jubilee Circle meets every Wednesday at 9:30 a.m. for fellowship and crafts. For Youth: The Youth Group meets through the school year for a wide variety of social and service activities. LUMC also sponsors Boy Scout and Girl Scout troops. For Children: Sunday School is held at 10:00 a.m. during the school year. The Children's Choir sings in worship each month and meets for rehearsal on Sundays at 9:00 a.m. through the school year. Vacation Bible School is a week-long day camp each summer filled with fun games, crafts and music. Our Child-Safe Ministries program protects children and youth and the adult program leaders who serve them. The Jacobs Ladder Learning Center offers a quality preschool program sponsored by LUMC and hosted in our building. Tech Team: Our Living Well contemporary worship service is supported by a large team of technical volunteers, and we're always looking for more.